Saturday begins the extra-long July 4th weekend, and I am declaring my independence from shipped food. That’s right: my own Eat Local Challenge month is at hand. It seems that people who take up the challenge range from the very strict to the very casual, from those who just try to eat something local in every meal to those who strip their kitchens of everything grown more than 100 miles away. I will be taking the middle road. Everything must be grown in New England. I will try to buy from the closest possible source, but anything within the New England boundaries is fair game. I will also try to buy directly from the farmer whenever possible (farmers’ market eggs, rather than supermarket, even if both are grown in New England). Olive oil. I simply can’t bring myself to cook with only animal fat for a whole month, especially during salad season. Despite the fact that soybeans and nut trees and other things that can be made into oil can be grown in New England, there are no commercial sources I can find, and pressing oil is not in home-cooking territory. Vinegar. I screwed up here. I thoroughly intended to make some vinegar with New England wine, but I didn’t hunt down the wine soon enough. I will most likely be using red wine vinegar I’ve got brewing from a leftover bottle of Californian wine, figuring that at least that brings homemade frugality points. Again, I need vinegar for salads, given that I can’t use lemon juice either. If anyone can think of a substitute, I would love to get rid of this exception. I might just try to live without – lately I’ve been eating some salads sans dressing. But I reserve the right to a bit of vinegar. Yeast. Depending on how the sourdough starter works out, I might need yeast. Spices. I would guess I use something like 6 ounces of spice in a month (mostly pepper, cumin, cinnamon, ginger, paprika and nutmeg). The shipping-weight-to-culinary-value ratio makes the spice drawer a reasonable exception for me. I will use only fresh herbs, though. A few leftovers in my fridge. I have two eggs, a couple carrots, celery and my sauerkraut. I don’t intend to waste good food just because I wasn’t able to eat it up before the project starts. I will give a complete accounting of everything I eat and, to the best of my ability, where it was grown, including the inevitable slips off the wagon (I’m guessing chocolate chip ice cream and Bing cherries). And if I give up before the month is out, I promise a full accounting. I think anyone who is reading here probably knows why we should eat locally (fuel costs of shipping, the environmental benefits of preservation of farmland in urban and suburban areas, the transparency of agricultural methods that is involved when you can meet the farmer, etc.) But there’s a lot of grey ground. For instance, some have argued for the benefits of supporting organic farming in the developing world. And Wyman’s blueberries may help preserve open land in Maine, but they are probably shipped to a larger distributor before being shipped back to my supermarket. 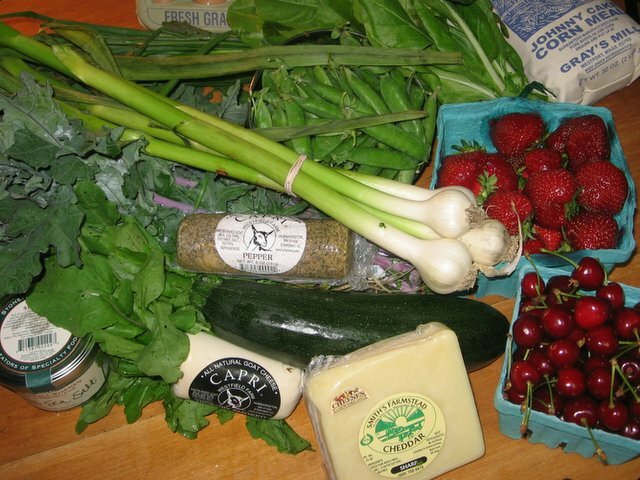 So why bother trying to be (somewhat) strict about local food for a month? What is the point? I’m not going to give up mangoes or lemons or even those buckwheat noodles from Japan for good. But I want to try this experiment because I want to learn more about how I eat. I want to pay attention to every bite that enters my mouth and be mindful of how it connects to the larger food system. I want to challenge my cooking skills. I want to try new things and to go deeper into the culinary history of New England. And, heck, for health reasons I would probably do well to eliminate white flour and white sugar from my diet. Thoreau said that if there is an experiment you want to try, you should do it. Always listen to Thoreau. So goodbye (for now) to chocolate, coffee, margaritas, lemons, wine, pizza, popcorn, peanut butter, Petsi’s scones, Toscanini’s ice cream, and those M&Ms the receptionist keeps on her desk. Scallions, strawberries, zucchini and chard from a farm at the Brookline farmers’ market – stand too busy to ask, no signs. 1 can mussels, Look’s Gourmet Foods, Whiting, ME: 340 miles. Julie Powell complained that an obsession with local eating a la Alice Waters leads to shopping replacing cooking. And perhaps she has a point, because in the last few weeks, preparing for my Eat Local Challenge month, I've done very little cooking and quite a bit of shopping. What we have here is a local honey "in the rough," which means filled with bits of honeycomb and pollen and all the stuff I should be eating to toughen my immune system and beat my allergies into submission; a can of Maine mussels, ready for a quick chowder on a weeknight; whole wheat flour from Maine, less a few cups in the lost sourdough starter; and the Maine mix of dried mushrooms from Oyster Creek Mushrooms. I've also got some reeal ground flint corn from Gray's Grist Mill in Rhode Island, but it arrived too late for the group picture. I'm itching to get started with all this good food, but I'm restraining myself, because I'm going to need the backstock in another week. In the meantime, the farmers' markets are starting to offer some selection. We've already passed the asparagus, amazingly enough. The lettuce is out in full force, and some of the cooking greens are showing up as well. I've had scallions and garlic scapes. Things are looking up. And of course the strawberries have arrived. So far, I haven't had a really amazing berry. I'm pessimistic about finding anything outstanding in this year's crop. The long rains this spring will give us watery, bland berries; they need the sun to concentrate their sugars. But I keep testing, just in case. I've noticed my titles are getting more and more boring. "Sauerkraut." I need to work on that. But sauerkraut is pretty straightforward stuff. I shredded a whole cabbage, added salt, celery seeds and juniper berries, pounded the heck out of it until there was enough liquid to nearly cover, added a little whey drained from some local yogurt, and covered with cheesecloth. Over the cheesecloth I placed a plate and then another layer of cheescloth, with a heavy bottle on top to weigh it down. Several days later, I had sauerkraut. 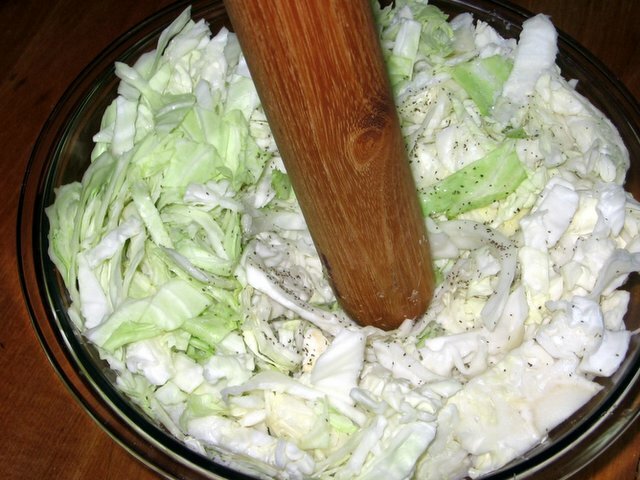 Now, as kitchen alchemy goes, making your first sauerkraut isn't quite on the level of baking your first yeast bread or caramelizing sugar for the first time. But it's still mighty satisfying. 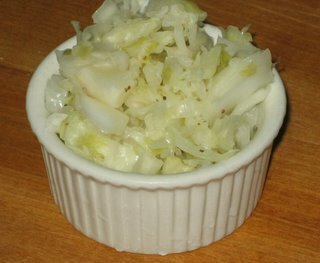 This sauerkraut is mildly sour, not too salty, beautifully crunchy; over a success. I'm now emboldened to try variations: a little shredded carrot, some hot pepper. The sauerkraut sky is mine. Robert Beverly Hale, the famous art instructor, used to say, "If you haven't drawn for a week, you'll know it. If you haven't drawn for two weeks, everyone will know it." It seems the same applies to cooking. In case you've forgotten, I ruined a batch of sauerkraut by adding twice the required salt, but I was happy nonetheless because my sourdough starter was bubbling on schedule. Well, um, that starter? I went to feed it on Sunday, only to discover a fermenting mass beneath - and a canopy of mold above. And these were interesting molds, not just your garden variety white bread mold. No, these had structures, nobules, spray formations and color patterns. I think I may have screamed. I was crazy enough to go online to see if the starter could be salvaged. After all, I had paid shipping on that flour; that was certainly the most expensive flour of my life, and it was hard to accept the inevitable. But I did. There's a running theme through all the advice pages on sourdough: if you find mold, toss it. So my insanely expensive fermented paste got flushed. I was using no yeast, and I think that's where things went wrong. A little yeast probably does get things going faster, so the mold has less of a chance. According to one person I read, the initial strain of yeast is crowded out by local yeasts after two or three feedings anyway, so my "symbolically local" issue need not suffer too much from a bit of yeast in the starter. I also was following instructions to feed alternate days after the first two days, and most other sourdough recipes seem to indicate daily feedings are required for the first week. So tonight I will start again, a modern-day Sisyphus of the kitchen. I'll let you know how it goes. Fortunately, I was able to make some actual edible food this weekend, a braised chuck roast with horseradish from Please to the Table, which was excellent, though much milder than expected, and fried potatoes with mushrooms from the same, which was delicious, if absurdly rich. I also threw together a buttermilk sherbet, and I really did throw it together - I don't know how much sugar I added, and when I realized I had no lemon, I added some pineapple juice instead. It was really good, which soothed my rather battered ego. When something hits Time Magazine, you know it has officially arrived. I'm not saying your mom and Aunt Sally won't still roll their eyes when you start talking about the importance of pasture or eating locally over Thanksgiving dinner, but they will at least have heard about this stuff. Progress! 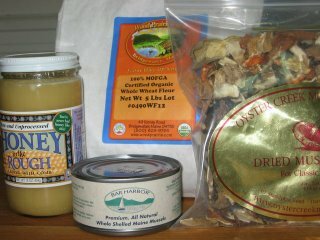 Here's the Time article on grass-fed beef, and here's their article on the 100-mile diet. I've started a sourdough with flour from Maine. I used just filtered tap water and flour. No yeast! This is more a symbolic and aesthetic gesture than an indication of real purism. I love the idea of local wild yeast slowly growing and fermenting, ultimately ending in truly local bread. I haven't made sourdough in a long time, mostly because a commitment to frequent baking is required to make it worthwhile. It may take me a while to get back in the swing. My friend E., who is married to the cheese salesman, keeps a sourdough going that is very much rooted in her kitchen - all her bread tastes just a little like cheese. The sourdough must pick up on certain cultures from some of the cheeses. My kitchen is less fertile with living foods, but I'm working to change that. My sourdough was bubbling a bit last night, so it seems all is well. All was not well, sadly, with my first attempt at sauerkraut. You see, I am essentially an idiot when it comes to math. I have a somewhat impressionistic relationship to numbers, and, as a results, sometimes I put in twice the necessary salt. Not often, but sometimes. So my sauerkraut, still in its early days, tasted about as salty as a cheap dill pickle. I dumped it. Fortunately, the cost of salt and cabbage is negligible. I can afford to start another batch this weekend. The sauerkraut project is unnecessary, at least as far as obtaining local ingredients goes. I can't yet get local cabbage, and I can buy excellent local sauerkraut from the good people at RealPickles. But I am feeling a deep need to have a living kitchen, full of fermenting things and growing things and slow-cooking things - the stocks and breads and fermented pickles and fine homemade things that give a kitchen a soul and a sense of place. I want these things to relate to the place around me, the New England fields and woods that I love. This is partly just a growing need for connection to my food source, but also I know a reaction to the death of my friend. Her illness was strange and complicated, but resulted in part from her neglect of her body in many, many ways, including failure to eat genuinely nourishing food. Our culture tends to split food into two groups - the bad-for-you-and-delicious and the good-for-you-and-awful. It's a match-up between a bacon double-cheeseburger and brown-rice with tofu. One day indulgence wins, the next day guilt wins, and both sides entrench their positions. But fast food really tastes terrible, and a lot of the health food options at your local co-op are highly nutritionally and environmentally suspect, despite their reassuring flavorlessness and green packaging. I don't want to eat like a McDonald's-scarfing American or a Gourmet-obsessed foodie or a hairshirt hippie. I want honest food, sustaining and good, that's all.